The Association of Independent Schools of South Australia is built on the belief that autonomy, respect and integrity infuse all aspects of our relationships with one another and the communities we support. Strengthening relationships with Aboriginal and Torres Strait Islander peoples and learning more about their cultures, lands and histories are important to the AISSA and to our member schools. It is our aim to increase cultural understanding, appreciation and respect for the history and traditions of Australia’s First Peoples. The AISSA’s commitment to reconciliation is embedded in our organisational culture. Our 2015-2018 Reconciliation Action Plan documents our vision for reconciliation and the actions we are taking to promote reconciliation. The Aboriginal Cultural Immersion Program aims to bring together current and aspiring School Leaders and educators involved in Aboriginal education, to experience first-hand the uniqueness of Aboriginal culture. This program will provide opportunities to deepen your understanding of Australia’s First Peoples, to enable you to lead with greater insight the reconciliation initiatives in your community. Arrive in Nhulunbuy (Gove) and Welcome to East Arnhem Land and Culture College! Over the next few days you will spend time in and around the town of Nhulunbuy staying at the Culture College base. During the afternoon/evening students and staff will take part in a Culture College induction presentation. There will be a briefing on the itinerary for the program. Learn about bush tucker, bush medicine, dreaming stories and aboriginal conservation and sustainable land management. Journey to a traditional Homeland. On arrival you will be part of a traditional Yolnu welcome to country. Meet and interact with members of the family that will be hosting us over the next few days. We will set up camp and wait for the clearest night sky you have ever seen! After our farewell dinner we get together to share everyone’s thoughts of our time on country in Arnhem Land. Swap stories and memories of this amazing trip of a lifetime that you have just experienced! We will pack up camp this morning and travel back to Nhulunbuy/Yirrkala for some final activities before we share our final night in Arnhem Land. Say goodbye today and we will look forward to your return to this unique and wonderful part of Australia! In May 2018 the team at the Association of Independent Schools of SA reflected on our reconciliation journey. This story began in 2014 with the drafting of our first Innovate Reconciliation Action Plan (RAP) and the launch of our RAP in May 2015. Our RAP journey has been both personal and professional and each one of us brings a unique perspective. The National Aboriginal and Torres Strait Islander Curricula Project aims to empower all teachers to integrate Aboriginal and Torres Strait Islander perspectives into their classroom practice. This resource will assist teachers to implement the Australian Curriculum through implementing the Aboriginal and Torres Strait Islander Histories and Cultures Cross-Curriculum Priority in their classrooms. These resources will be around three themes, Fire, Water and Astronomy. The Astronomy teaching guide is now available. This book provides primary sources such as early explorers’ journals to challenge beliefs that the Aboriginal peoples of Australia were hunter gatherers. The quotes below will provide a sense of how the author and different readers understand this evidence. Phenomenom have a variety of engaging and fun free teaching resources related to food literacy. Some of these resources listed below focus on Aboriginal histories and cultures. Wardandi Bibbulmun Elder Aunty Dale Tilbrook, tasting native tubers youlk and warrine, and learning about traditional farming techniques. Refer to the Primary Years Teaching resources linked to the Australian Curriculum. Wardandi Bibbulmun Elder Aunty Dale Tilbrook is welcomed to Wurundjeri country by Senior Wurundjeri Elder Aunty Di Kerr, and they discuss the significance of the Welcome, Indigenous farming principles, and why certain plants grow in different parts of Australia. The City of Charles Sturt website provides a resource that could be useful for teachers with insights into Kaurna culture around the time of ‘colonisation’ and the impact of ‘colonisation’ over time: The City of Charles Sturt; Kaurna Meyanna Cultural Mapping; A People’s Living Cultural Landscape. These videos will support teachers in the Early Years to introduce the Kaurna language to students. When people come together, they greet each other as a sign of acknowledgement and respect. The Welcome to Country and Acknowledgement of Country play important roles in acknowledging and respecting Australia’s Aboriginal and Torres Strait Islander peoples. They are integral parts of recognising that our First People’s histories and cultures have been in existence for more than 55,000 years and that they are alive and of significance today. After rapid continent wide colonisation by Aboriginal Australians nearly 50,000 years ago, this is recent evidence in the DNA of discrete language groups that these groups have been continuously present in specific geographical areas dating back to 50,000 years ago. This recent research by Adelaide University adds another layer to understanding the deep Aboriginal Australian cultural attachment to their country. While they may all no longer necessarily be the title-holders to land, Aboriginal and Torres Strait Islander Australians are still connected to the Country of their ancestors and most consider themselves the custodians or caretakers of their land. A Welcome to Country is a ceremony performed by Aboriginal or Torres Strait Islander custodians or traditional owners of that country, to welcome visitors to the land of their language group. It can take many different forms depending on the culture of the traditional owners. It is usually delivered by an Elder, but can be delivered by another person. It may include singing, dancing, smoking ceremonies or a speech in the traditional language or English. 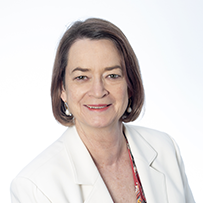 Every time a formal Welcome to Country is given it continues a long tradition that has been an important part of Australian culture – with the exception of a recent lapse of about 200 years. It was always given by way of welcome when permission was granted to visit the Country of a different language group. An Acknowledgement of Country is a way of showing awareness of and respect for the traditional Aboriginal or Torres Strait Islander owners of the land on which a meeting or event is being held. It recognises the continuing connection of Aboriginal and Torres Strait Islander peoples to their Country. For educators wishing to learn more, Reconciliation SA provides additional information and resources about the Welcome to Country and the Acknowledgement of Country. From 2015 until the end of 2019, the AISSA will work with SA Independent schools to affirm and support Indigenous secondary students through providing a student mentoring program. The Indigenous Secondary Student Mentor Program strives to provide Indigenous students with relevant and engaging mentoring support, allowing them to grow and develop as they continue their education. The program aims to encourage social and emotional well-being, identity development and contribute towards positive educational outcomes and post-secondary school learning opportunities. The mentoring is provided at no cost to students and parents. The program will take place during each school term and will comprise 1-1 mentoring, small group peer mentoring and e-mentoring, as well as opportunities for geographical cluster student meetings. Upon enrolment, students can be involved in the mentoring program up to the end of 2019. The program will be flexible and contextual in its approach to best accommodate the needs of the students and will work in collaboration with school staff, families and students using a strengths-based approach. Each year we survey the students regarding the impact, strengths and goals of the program. Please find the 2018 results below (click to enlarge). The AISSA Mentor is Justin Wilkey (wilkeyj@ais.sa.edu.au or 08 8179 1437), a proud Aboriginal man with family connections to the Ngarrindjeri peoples of the Lower Murray River. Justin’s professional background has involved many roles in working with young people; a teacher, disability support case manager and youth worker. He also has a communication background and has spent time working at the ABC as a multi-media journalist. Reconciliation is about building better relationships between the wider Australian community and Aboriginal and Torres Strait Islander peoples for the benefit of all Australians. Through reconciliation, we will be part of creating an Australian culture that acknowledges and deeply respects Australia’s First Peoples as a fundamental part of our identity as a nation. Narragunnawali: Reconciliation in Schools and Early Learning is designed to support early learning centres, primary and secondary schools in Australia ‘to develop environments that foster a higher level of knowledge and pride in Aboriginal and Torres Strait Islander histories, cultures and contributions.’ The Narragunnawali website gives you access to curriculum resources, professional learning resources and guidance to develop a Reconciliation Action Plan. A Reconciliation Action Plan (RAP) is a declaration of commitment and action to promote reconciliation between Aboriginal and Torres Strait Islander peoples and the wider Australian community. Narragunnawali RAPs are created through an online platform designed to guide teachers and educators through the development of a Reconciliation Action Plan specifically designed for your school or early learning centre. The documentation of the RAP can be completed online in one day and after the approval of the Principal be automatically sent to the Narragunnawali Team for review. Once reviewed, the school and a summary of RAP commitments appears on the national ‘Who has a RAP?’ map. maintaining the momentum required to make a RAP meaningful and sustainable. The Reconciliation SA website has an Education Pack that focusses on Aboriginal and Torres Strait Islander service men and women, Forgotten heroes: Honouring the Service and Sacrifice of Aboriginal and Torres Strait Islander Peoples. This resource provides ideas for classroom teaching and learning linked to the Australian Curriculum. In addition, the resource provides a number of resources, many of which can be accessed online. This DVD tells the story of the Aboriginal and Torres Strait Islander War Memorial which was unveiled in 2013 in Torrens Parade Grounds. This memorial gives overdue acknowledgement of the history and service of Indigenous men and women. This film reflects upon the experiences of Aboriginal military personnel from the Boer war to the current day. The film considers why Aboriginal people have chosen to enlist and describes their experiences of life within the armed forces and the challenges they faced returning to civilian life. For copies of this video please contact Monica Williams williamsm@ais.sa.edu.au or (08) 8179 1417. Aboriginal and Torres Strait Islander histories and cultures are foundational to what makes Australia unique in the world. We have an opportunity now, to foster pride in Australia’s First Peoples by the way we integrate their perspectives into our students’ learning. Aboriginal and Torres Strait Islanders have 50,000 or more years of histories in Australia and today their cultures and communities are strong and diverse. As the world’s oldest living cultures and Australia’s First Peoples, there are exciting ways to weave this important knowledge into the curriculum. All students contribute to reconciliation through recognising, respecting and learning more about Australia’s First Peoples. Resources for teaching and learning can be found at Narragunnawali, Reconciliation SA and Reconciliation Australia. The students and teachers at Maitland Lutheran School embedded the language of the traditional owners of the land – the Narungga people, into the new ACARA Digital Technologies subject. This case study explored how Narungga, the ‘sleeping’ language of one of the oldest living cultures in the world could be reinvigorated using an emerging technology, in this case a humanoid robot. 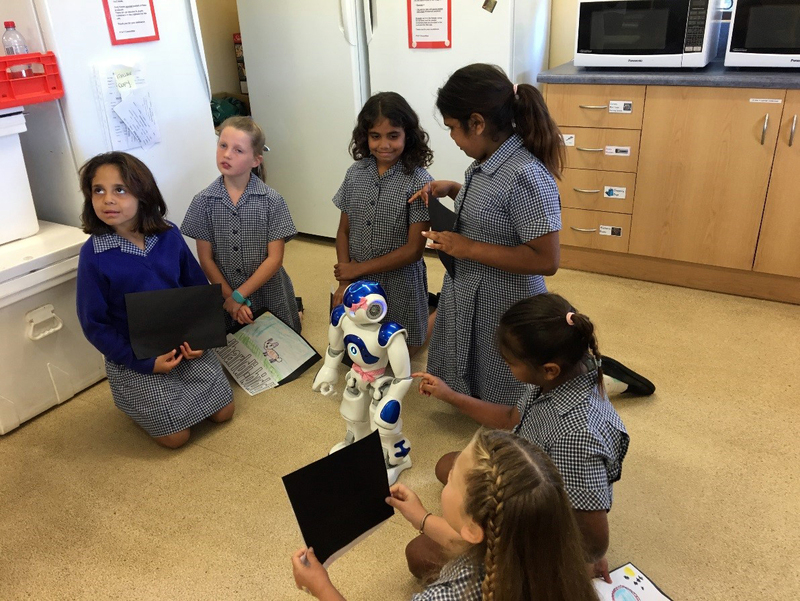 Pink, the NAO humanoid robot was integrated into the teaching and learning at Maitland Lutheran School in South Australia as part of the process of building respect and understanding about the Narungga language and culture. In this case study, the ACARA Aboriginal and Torres Strait Islander cross curriculum priority was embedded into everyday classroom learning through the new Digital Technologies subject. In this case study, the school Principal worked in partnership with the local Aboriginal peoples and through them, invited the only fluent speaker of Narungga (Tania Wanganeen, a Narungga woman) to share her knowledge of Narungga language and culture with the students and teachers. Tania developed the confidence of teachers and students to correctly speak aspects of the Narungga language and then, the teachers and students used their knowledge of Narungga language to program Pink to speak in Narungga. 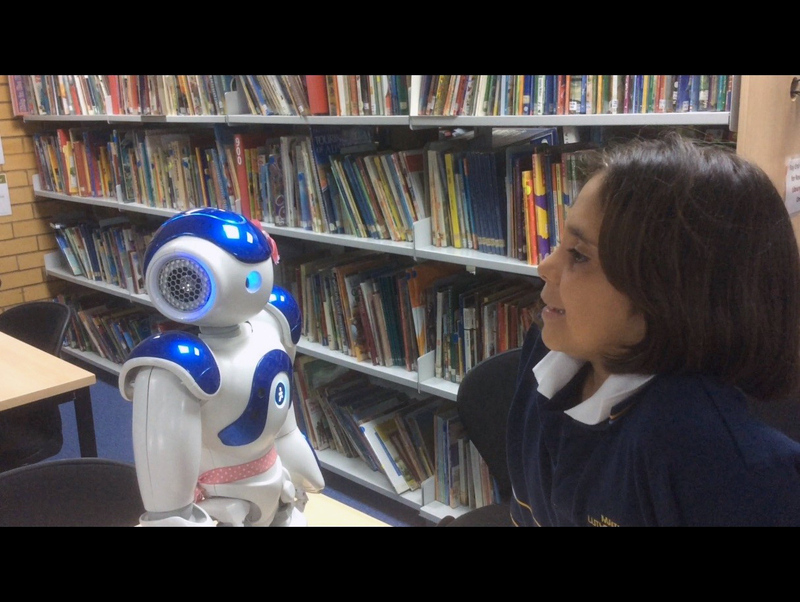 The students and teachers were learning two ways of communicating simultaneously, the ancient language of Narungga and the more recent humanoid robot programming language. The video below captures some of the learning in the Year 1, 2 and Year 4 classrooms in Terms 3 and 4 2016. Peter discusses how the human like qualities of the robot fosters resilience and problem solving in students as they work collaboratively to program Pink. Peter’s Year 3 students created a program so that the humanoid robot could walk through a maze that represented parts of Australia and used Narungga place names. This actively required Year 3 students combining mathematical thinking and computational thinking so that Pink could successfully be programmed to navigate through the maze. Students at Maitland Lutheran School on the Yorke Peninsula programmed Pink to say the Acknowledgement to Country in the Narungga language. Narungga is the language of the traditional owners of the Yorke Peninsula. The students found that the robot did not reproduce correct Narungga pronunciation from the spelling of some Narungga words, so they experimented with different phonetic combinations to create the correct pronunciation. The Year 1 and Year 2 Aboriginal students created pictures of animals native to the local area prior to invasion and programmed Pink using visual recognition software to say the name for the animal in Narungga. So, when Pink recognised the picture that had been pre-programmed by the students, she said the name of the animal in Narungga. These students also used facial recognition software to program Pink to recognise individual student faces and then greet them in Narungga. Ameerah pictured below, programmed Pink to say ‘Nigh Ameerrah knuckle ja‘ which means ‘I see Ameerah’. The Reconciliation SA Education Steering Committee has collaborated with Pulteney Grammar School and the AISSA to develop a case study approach that captures a whole school methodology to reconciliation. Through a series of seven vignettes, school leaders explore the philosophy and pedagogy that has transformed their school’s thinking and learning about the Australian constitution through the lens of reconciliation. The early years’ vignettes highlight teaching strategies within a Reggio Emilia philosophy that embed into daily practice, Aboriginal and Torres Islander histories and cultures. The vignettes demonstrate that very young children can engage in deep learning about complex, abstract concepts concerning justice, governance and recognition. Whole School Thinking 1: The Principal of Pulteney, Anne Dunstan, and Head of Kurrajong, Virginia Evans, emphasise the importance of a strong vision for reconciliation. Whole School Thinking 2: Teacher leaders Briony Franklin and Janice Copeland highlight that honouring Aboriginal peoples is fundamental to true Australian citizenship. Community and Citizenship: Australian Citizenship involves reconciliation. Connection to Land: Aboriginal peoples have a deep spiritual connection to the land and learning about Aboriginal cultures is more authentic for children in a natural environment. Symbolic Writing: Ancient Aboriginal symbols empower very young Australian citizens to communicate in a written form. Thinking and Learning in Kaurna: Learning an Aboriginal language provides a deep insight into an Aboriginal culture which fosters respect and reconciliation. Reconciliation: Learning emerges from the children’s questions about reconciliation and provides opportunities for deep thinking. The AISSA invites schools interested in being part of a case study to highlight whole school methodology and pedagogical practices that build a culture of reconciliation in the Primary, Middle or Secondary context to contact Monica Williams at williamsm@ais.sa.edu.au or call 08 8179 1417.